AUSTIN, TX -- (MARKET WIRE) -- November 7, 2005 -- Axalto, the world's leading provider of microprocessor cards, "will provide approximately five million of its contactless smart payment cards to top banks in the United States by the end of this year," said Paul Beverly, president Americas for Axalto. The issued MasterCard® PayPass™ cards will include both credit and debit cards to enable "wave and go" payments. 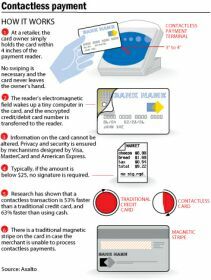 "U.S. financial institutions are leading the move to contactless payment cards," Beverly added. "Axalto is committed to helping these institutions put a contactless card in the hand of each consumer to bring payments into a future that is faster and more convenient." Axalto's smart payment cards, manufactured in Maryland in the United States and in Orleans in France, contain best in class contactless technology to ensure privacy and security for cardholders. The cards provide superior read range and are specially designed for durability. Axalto's product also has an optional embossing capability that allows issuers to use all four available lines for embossing on the front of the card. Issuers use this fourth line to add a company name and for other marketing purposes. According to market estimates by Frost & Sullivan, Axalto holds a leading position in banking smart cards in the world, with total shipments exceeding 70 million smart banking cards in 2004. Axalto (Euronext: NL0000400653 - AXL) is the world's leading provider of microprocessor cards (Gartner 2005, Frost & Sullivan 2004) -- the key to digital networks -- and a major supplier of point-of-sale terminals. Its 4500 employees come from over 65 nationalities and serve customers in more than 100 countries, with worldwide sales reaching 3 billion smart cards to date. The company has 25 years' experience in smart card innovation and leads its industry in security technology and open systems. Contactless payment is taking off in the United States<br>and Austin-based Axalto Inc. will provide approximately<br>five million contactless cards to top banks by the<br>end of this year. American Express, MasterCard and<br>Visa USA have all launched contactless payment<br>initiatives and many top retailers, such as McDonald¿s,<br>7-Eleven and CVS, have deployed payment<br>terminals to accept the new cards.